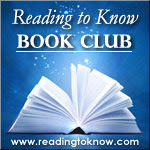 A Tale of Two Cities :: Reading to Know Book Club December CONCLUSION! Jonathan picked this past month's read and below are his concluding thoughts. If you read along (or have read this title at any time in the past) and have thoughts to share, please link them up in the comment section below. But one thing I'll comment on is a theme which struck me throughout the book, which is the way scenes of France alternate showing the oppressive rule of the aristocracy with the bloodthirsty response of its citizens. It portrays the time of the French revolution (fairly accurately, I'm going to assume) as being one in which mutual loathing between the ruling and the lower classes produced some of the most cruel treatment to be found in history. It's an ugly cycle that begins when we lose our perspective of God's image that exists in our fellow men, and instead see them exclusively through our own eyes and attitudes – magnifying our own preconceptions of their inherent worth (or lack thereof) or the degree of their sins toward us (or others). We are very quick to judge others who are in any way connected to churches, philosophies, social movements, or practically anything else that we disagree with. And when this attitude is carried even further, it turns into backbiting and gossip about our "friends", as little offenses grow to staggering proportions. But this never really solves anything, does it? As Dickens show us in A Tale Of Two Cities, the results of this kind of "conflict resolution" (or not), taken to an ultimate extreme, create mass hysteria and chaos so severe that uninvolved bystanders fear for their lives. Obviously, I'm grateful not to be living under a level of oppression where the only foreseeable relief would require the mass execution of the ruling class. I'm grateful that, even when polls claim that 83% of Americans disapprove of Congress, no one is prescribing, as Dickens sarcastically described it, "the whipping-post, another dear old institution, very humanising and softening to behold in action." I'm grateful that, whether we are grappling with social justice or just feeling bitter about what someone said at the church potluck, there ARE things to be done which will proactively help deal with the issue. But, talk is cheap, and addressing the problem head-on takes hard work, which is why our natural tendency is just to whine about it until we feel better, and then go off and think about something else. So, as 2014 is upon us, when you feel an attitude of bitterness rising up for whatever reason, ask yourself if you're willing to take the steps necessary to "bury the hatchet" and address the situation with the methods that Scripture prescribes. Or you may end up like Madame Defarge. And this, friends, brings us to the conclusion of our 2013 book club reading year. Again, you can see the list for the 2014 online classics book club here. We hope you'll join in on some of next year's reads. 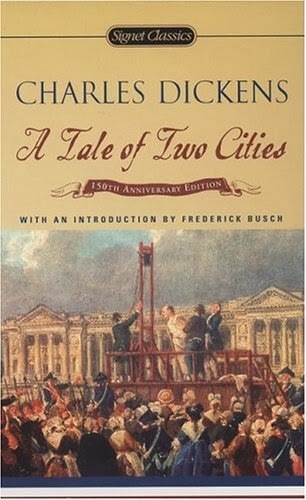 Did you read A Tale of Two Cities with us? If you wrote up a blog post detailing your thoughts, please link to it in the comment section below. Feel free also to leave your general opinion/impression of the book, regardless of whether or not you wrote up your own post. I'm proud of you for finishing it, Carrie, and I'm eager to hear what you thought. Did the end make it worth it for you? I admit it makes much more sense reading it a second (or third or fourth) time - then it's clear how every scene and character fits into the whole and works toward the ultimate end, whereas the first time through I admit it can be confusing. I agree with Jonathan's thoughts, too - the world's "best" way, in their minds, to deal with oppression is to overthrow it and become the new oppressors, but God has better ways, and if we're not careful we can fall into that pattern instead of His. I too am still working on it! I am determined to finish it though. It will give me a late start on Don Quixote but I must see it through! I wanted to read it but never found the time to even get started. :( Hopefully I'll be able to get to it eventually.